Tim Sherwood said speculation about his future as Tottenham manager has not affected his focus on helping the club finish the season strongly. Before the 5-1 win over Sunderland, the Premier League club let it be known they would meet Sherwood in the summer to review the season, after reports suggested he would lose his job. "[The speculation] doesn't affect me," Sherwood said. "I'm going to focus on getting the best out of the players in the final games." 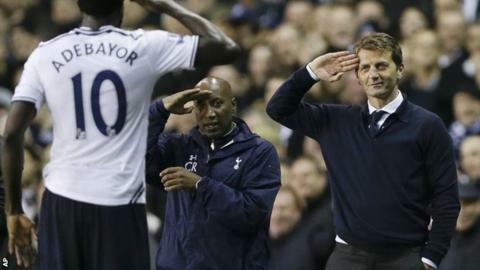 Sherwood, who replaced Andre Villas-Boas in December, has seen his side lose three of their last four league matches. The club were also knocked out of the Europa League at the last-16 stage in March. And last month, former Chelsea manager Ruud Gullit claimed Netherlands coach Louis Van Gaal had been asked to take over at White Hart Lane after the World Cup. "Nothing has changed. I have had the chat about next season, players I have identified and pre-season," added Sherwood. Monday's win lifted Spurs up to sixth, four points behind Everton, who occupy fifth position and a Europa League spot. The match started badly for the home side when a defensive mix-up saw them fall behind to Lee Cattermole's goal. But two goals from Emmanuel Adebayor, plus strikes from Harry Kane Christian Eriksen and Gylfi Sigurdsson ensured an impressive victory. "It was a good end to a day where we needed to win the game," Sherwood said. "We came here and we knew we had to respond to the [4-0 defeat] against Liverpool, and we did that today. "After giving them a goal - we're making a habit of this and we have to stop it - I thought we controlled the game from start to finish. "We stayed patient with the football, moved it around, made the pitch very big and got our offensive players on the ball in the correct areas of the field. "We created 29 attempts to score a goal - it was the most dominant football match you're ever going to see."